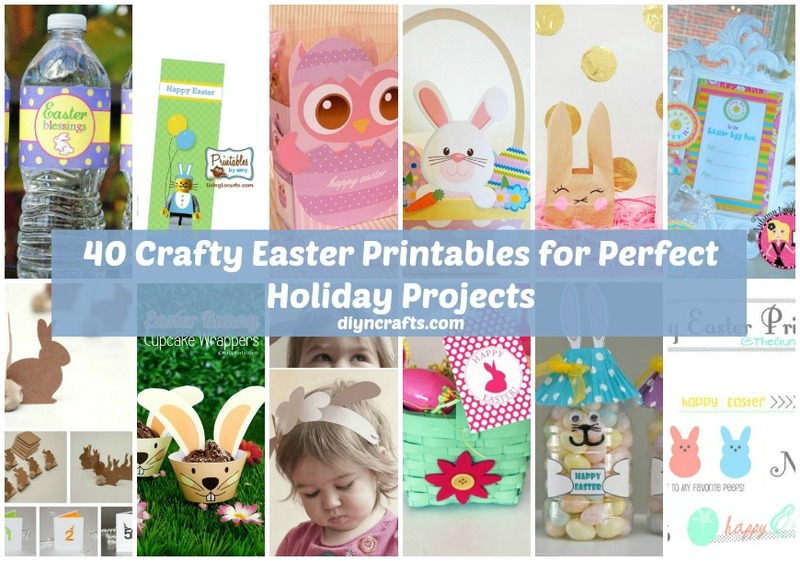 If you are looking to create a few Easter crafts, you may need printables. Printables give you the basis for your project and help you to create fun and exciting crafts easily. We have collected 45 of the best Easter printables to get you started on those Easter themed crafts. The printables are all completely free so you can just print them off and then make your craft. There is everything here from Easter cards to decorations and even a few treat bags that are great for those Easter parties. There are even printables for puppets that the kids will love. 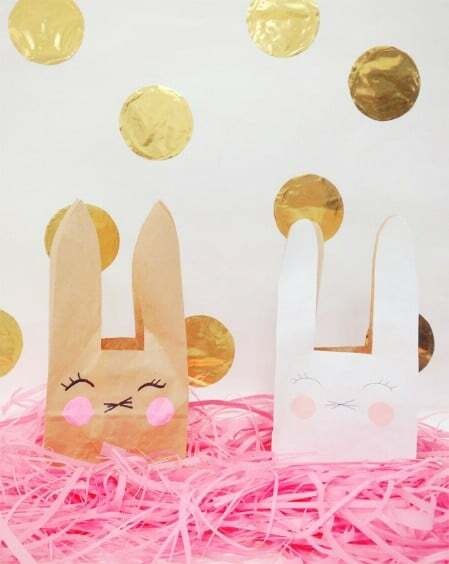 If you are planning to create your own Easter crafts and decorations, these printables are sure to get you started on the right foot. Print one or print them all. After all, they’re free and they will help you to create wonderful Easter crafts to suit just about any need. 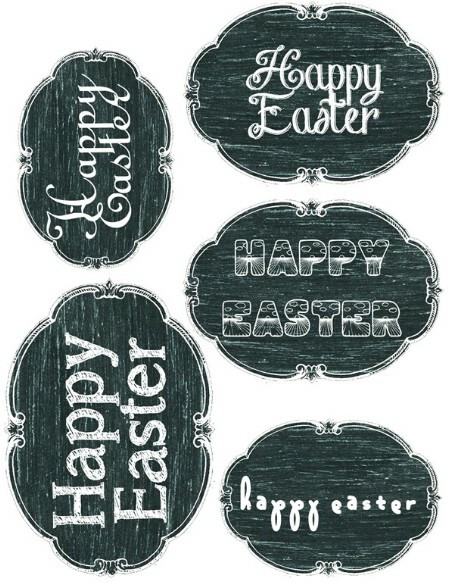 Printables are a great way to get some DIY Easter decorations. 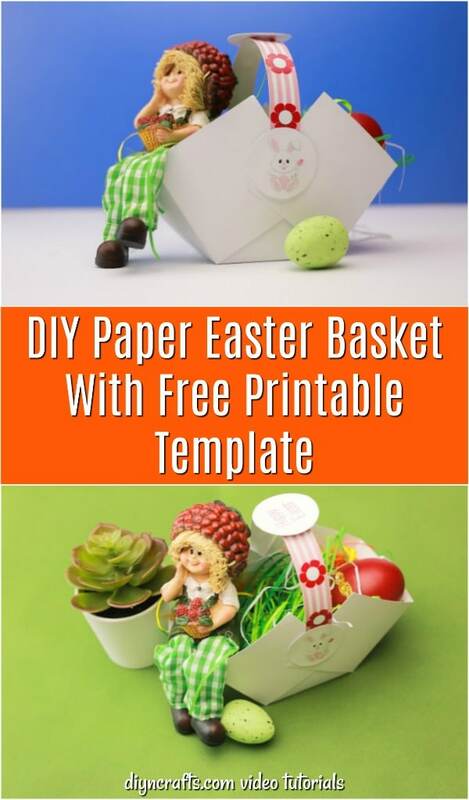 This one in particular gives you an adorable little paper Easter basket that is perfect for decorating. You just print it off and then assemble it. You can use plain printer paper, or if you want to really give it a unique look, you can also use colored paper, just make sure that it’s a light pastel color so that the printable comes through clear. You need to know where to cut and where to assemble. 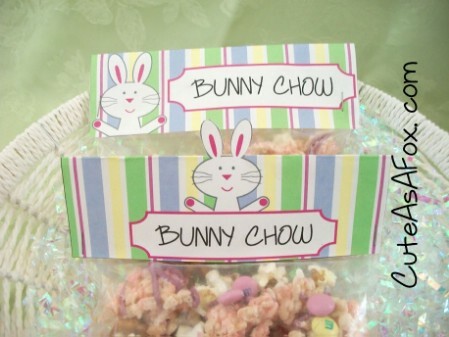 These little Easter bunny bags are great for Easter parties. Whether you need them for the kids to take to school or you just want treat bags for home, they are easy to put together once they’re printed. You just print out the template, glue the face onto a paper bag and cut off any leftover paper. Do them in different colors to have a paste collection of treat bags that are sure to please any kid at your party. Here is a really fun printable for your little ones to enjoy. 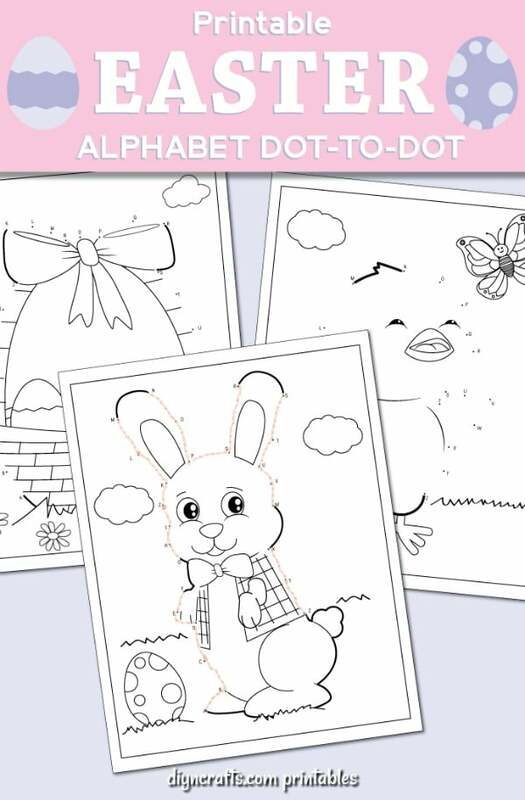 These dot-to-dot Easter activities include three different activity pages, all of which are fun for kids from toddlers to teenagers, and you can print them off for free. 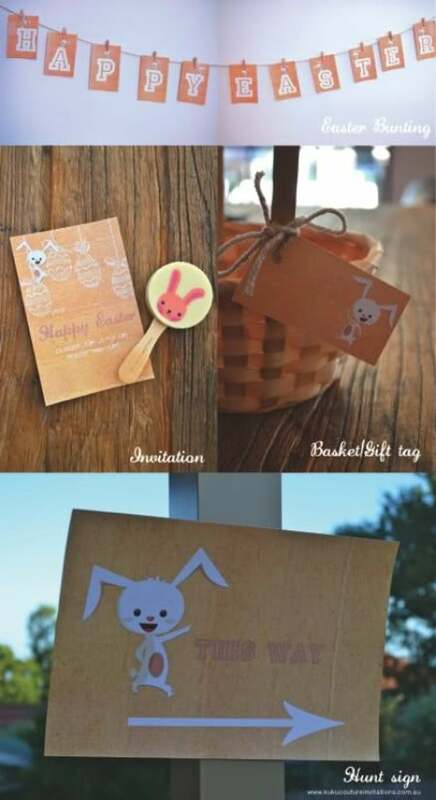 If you are making your own baskets or treat bags this Easter, these free printable Easter gift tags are perfect. These colorful eggs are the perfect way to add some DIY style to your homemade Easter gifts. These Easter coloring and activity printables are free for you to print off and they are the perfect activity pages for toddlers and preschoolers. You get nine total pages of coloring, matching and other games and activities with this printable. 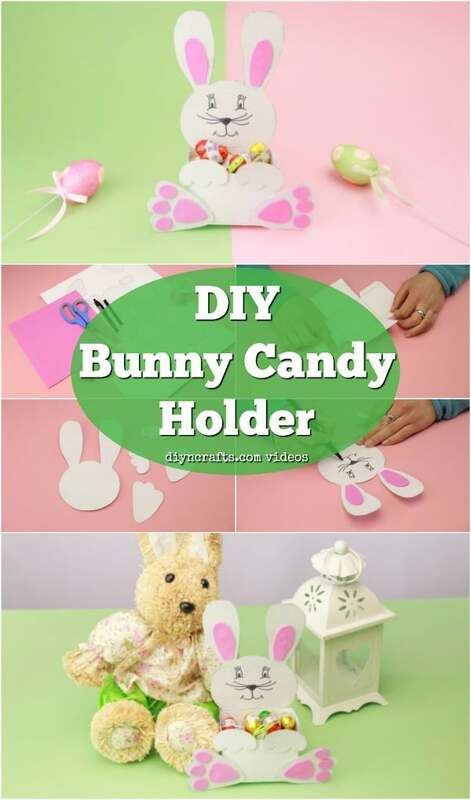 Print off the template for this super cute Easter Bunny candy holder and then just follow the video tutorial to put it all together. This is a super cute and super easy Easter craft, and it’s perfect for adults or kids of all ages. 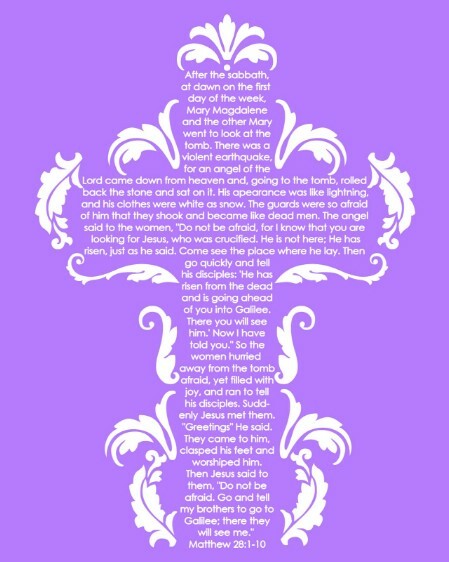 These printables have beautiful crosses on them and are embossed with the Bible Verse Matthew 28:10. The words create the cross and you can print these off in four different colors. The printables are in an 8X10 size but you could alter that size if you wanted to. These would be beautiful framed and hanging on the wall or you could frame them and add them to other décor on the mantel. Subway art is very popular and a very attractive way to decorate your home for the different holidays and seasons. This Christ Is Risen subway art printable is perfect for framing and adding to the rest of your Easter décor. It states its message in a number of different languages, making it as unique as it is beautiful. 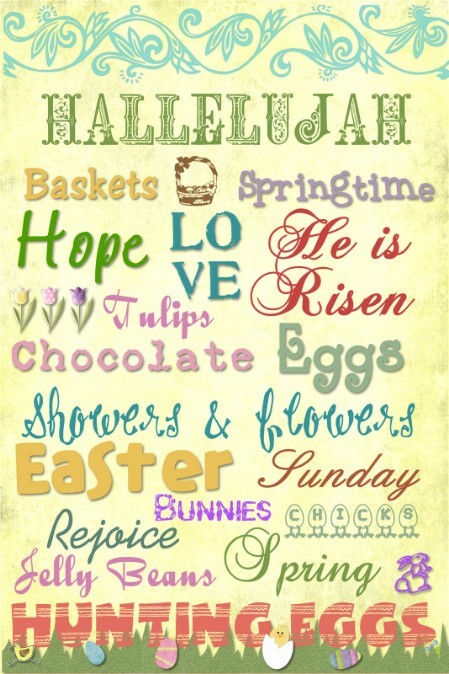 Simply print this off, frame it and use it to bring a little Easter spirit into your home this spring. These adorable Easter cards are sure to please everyone on your card list. They contain shadow puppets in the shapes of bunnies or chicks. You just have to print out the shadow puppets and then attach them to cardstock which you will use to write your Easter message. Kids will have a blast with the puppets which come off the card really easily. The puppets can be attached to popsicle sticks and tied with a ribbon to make them extra-special. These adorable bunny and lamb ears are perfect for little ones to wear on Easter. You just print them off and then put them together. They form a headband so they are easy to keep on little heads and you can print off either the bunny or lamb or make one of each. 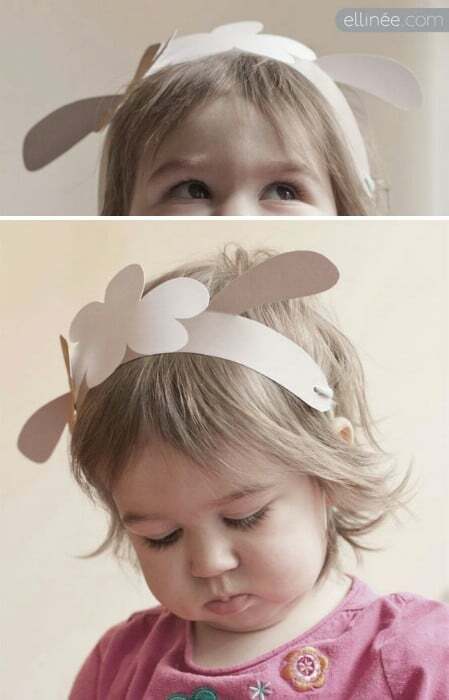 Little girls will adore these animal ear headbands with their Easter dresses and they are great for parties as well. 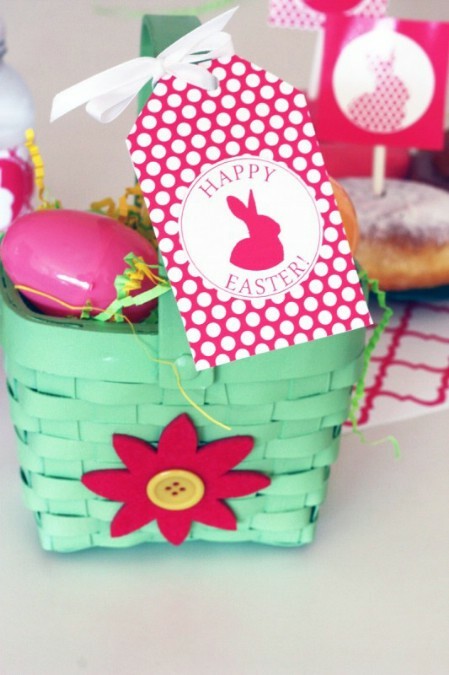 If you are hosting an Easter egg hunt, these printables are a must. 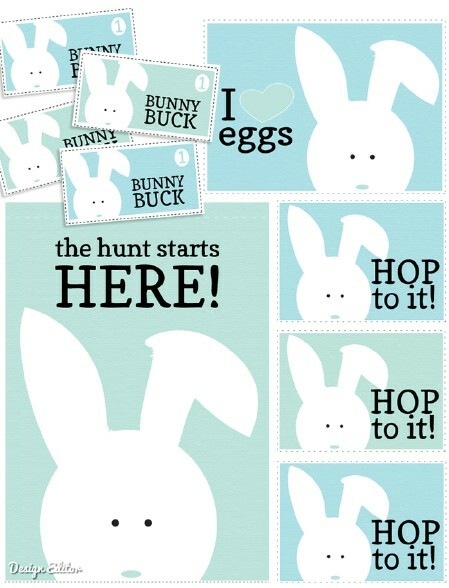 You get labels for baskets or buckets, prints that are perfect for framing, egg hunt signs to mark the hunt perimeters and great bunny bucks that you can use for those prize eggs. This is the ultimate collection of printables to help you to put on the perfect Easter egg hunt and ensure that everything is neatly organized and loads of fun. This collection of Easter printables is perfect for cards or other crafts. You get a wide selection of ways that you can say “Happy Easter” and there are Peeps, chicks and other characters to use. If you are planning to create party invitations or general Easter cards, this is a great collection for that. You can also print them off and frame them to add to your Easter décor. 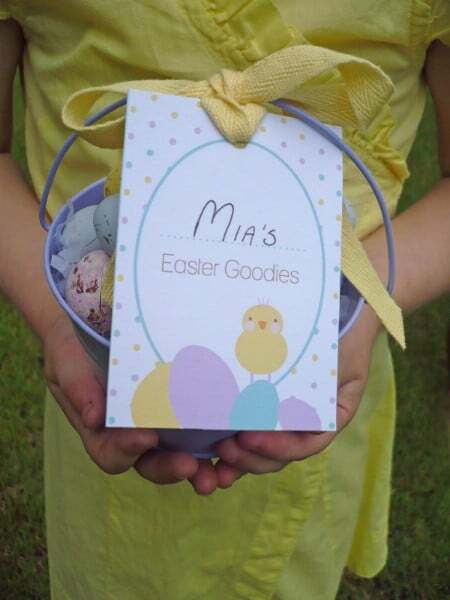 This collection includes Easter egg tags in a great chalkboard print as well as 8X10 images that you can print off and frame. 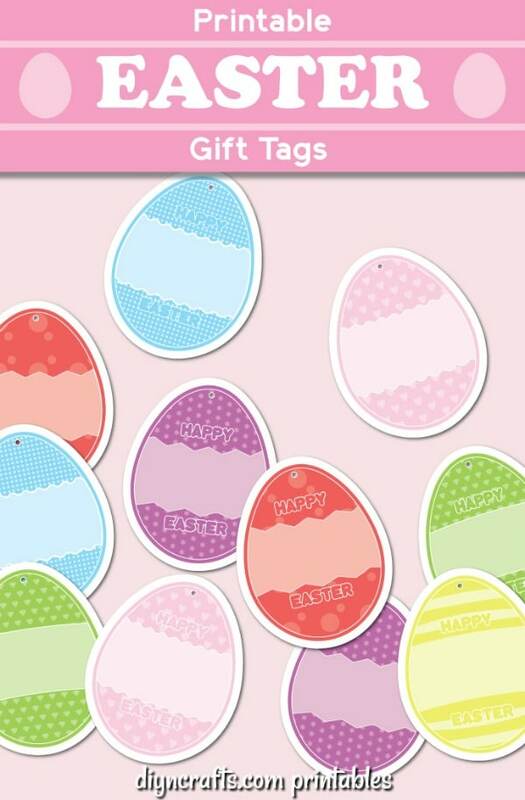 The tags are perfect if you want to decorate eggs a bit uniquely or you could use them as gift tags or add them to your Easter cards. The prints are great for decorating and can probably be altered to different sizes if needed. This collection includes absolutely everything you will need for a great Easter party or egg hunt. You get a banner, invitations, hunt signs and gift tags. You can just print these off and get started organizing that great egg hunt. Even if you aren’t planning a huge egg hunt at your home, you can use these printables for the smallest hunts or for an Easter party. These tags are great for teachers as well as parents. 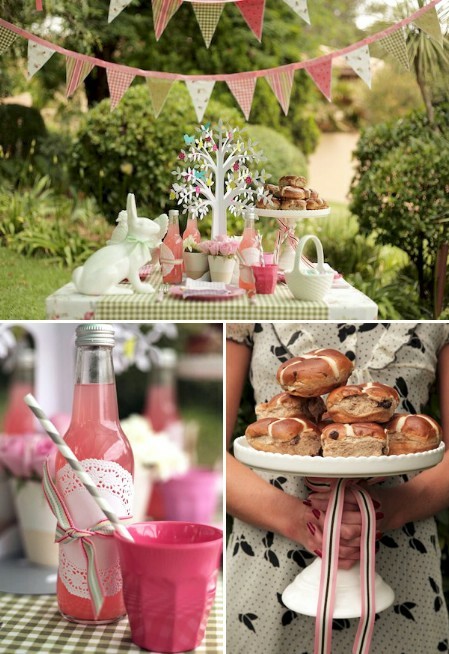 If you are planning an Easter party, these whimsical tags are perfect. They have saying like “Hatched something up for you” and “We’re only just a hop, skip, & a jump away.” They are adorable, colorful and really easy to get. 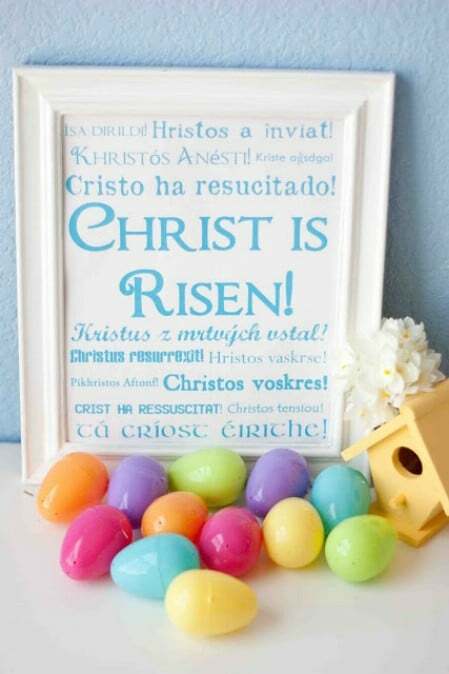 You just print them off on cardstock and they come in multiple colors so they are perfect for just about any Easter decorating project. 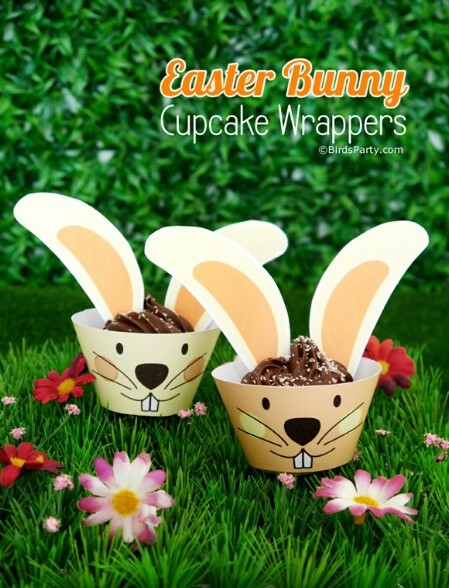 Imagine stocking your Easter party with these great bunny cupcake wrappers. You just have to print them off and then assemble them, which is really easy to do. You basically just have to cut and then wrap the printable around your cupcakes. 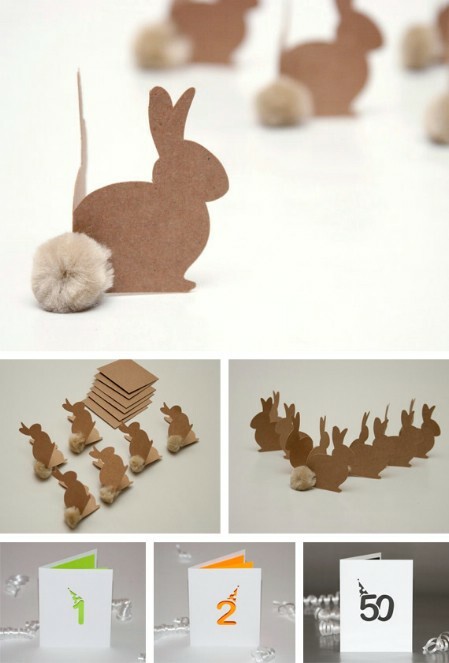 It turns each of them into a whimsical bunny which is sure to thrill kids and even adults at your party. These are great for school parties if you want something a bit unique for those cupcakes. 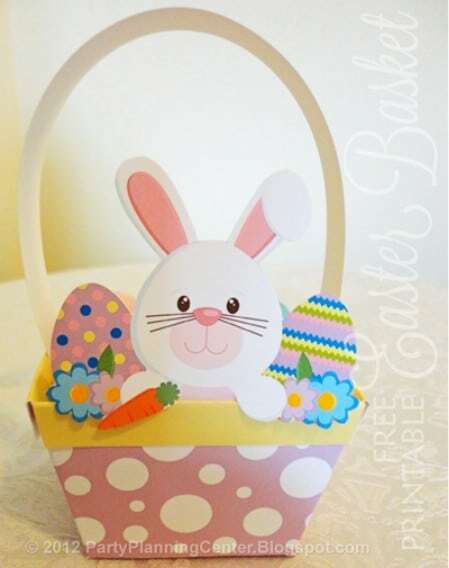 This is a fun little paper Easter basket with an adorable little bunny peeking out over the edge. The basket is super easy to make and takes just a little time. The template actually does most of the work and the printable includes instructions and photos to help you to assemble the basket. These are great for egg hunts, parties or just for decorations. If you are planning an Easter egg hunt, this would be a great printable to have on hand just in case someone forgets to bring a basket. These candy bag tops are 4 inches by 3.65 inches in size and are perfect for those of you who want to assemble their own homemade goodies for Easter. You just print them off and then staple or otherwise attach them to sandwich bags to have sealed and adorable bags of candy. These are great for parties or for whatever you want them for. They come in cute designs and three different colors. Whether you are planning an egg hunt, party or you just want something unique and fun for your mantel or table, this chalkboard banner is great. 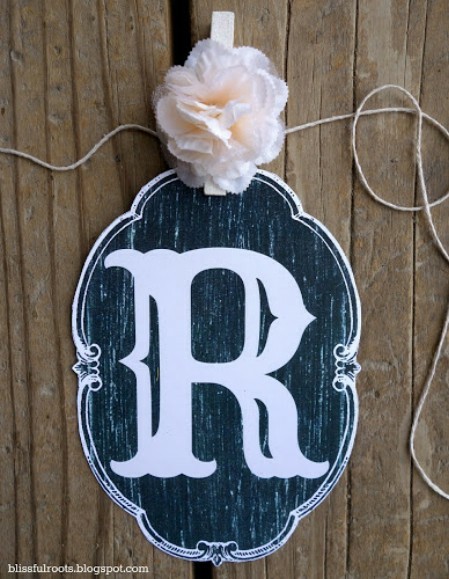 Each letter is printed onto cardstock and then you just cut around them and attach them together with twine, rope or ribbon. They have a great rustic look that is perfect for country décor. 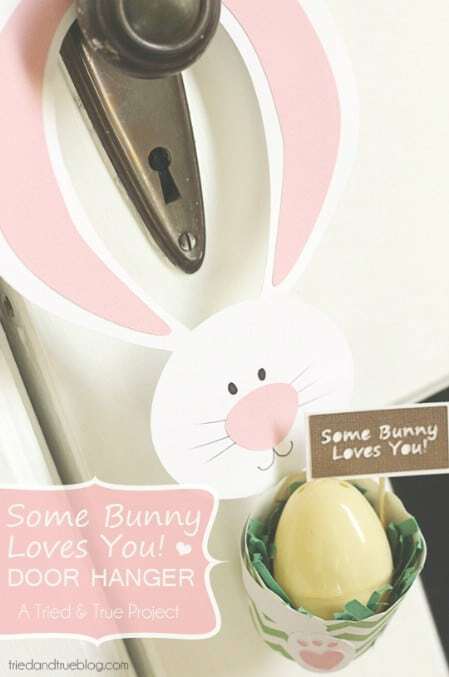 This “Some Bunny Loves You” door hanger is adorable. The bottom of the hanger creates a small basket so you can hang these on your little ones’ bedroom doors and leave them little treats in the basket in the days leading up to Easter. These are also great for parties or you can just leave them hanging on the front door if you want. They are very versatile and so adorable that you are sure to need more than one. These little brown bunnies are just too cute. You can decorate them by adding a small pom pom or a cotton ball for the tail. 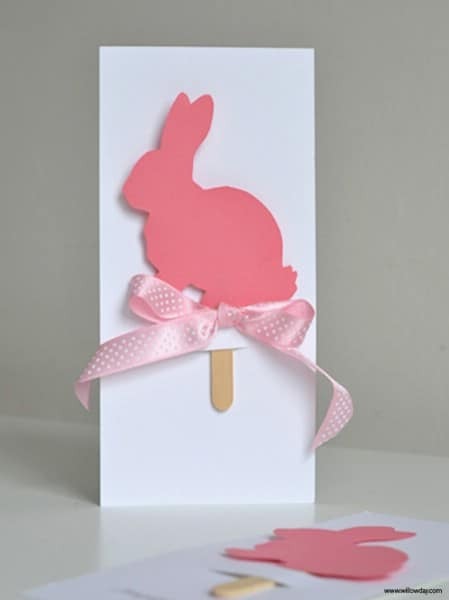 They are perfect for dressing up Easter cards or you could use them to decorate baskets or just about anything else. Hang a few of them together to create a little mini banner. This Easter bunting printable is gorgeous and so much fun to make. 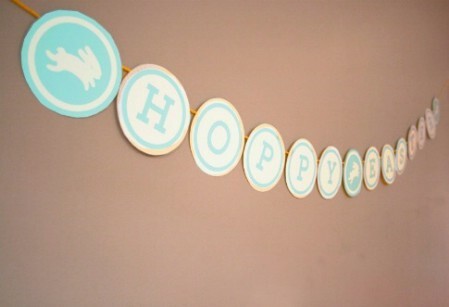 You just print out the individual letters, which spell out “Hoppy Easter.” Just download the printable, print them out and then cut out the circles. Then you can add string, twine or ribbon to hang them wherever you want. Either cut a hole in the circles or you can just hold them to the string with tape. 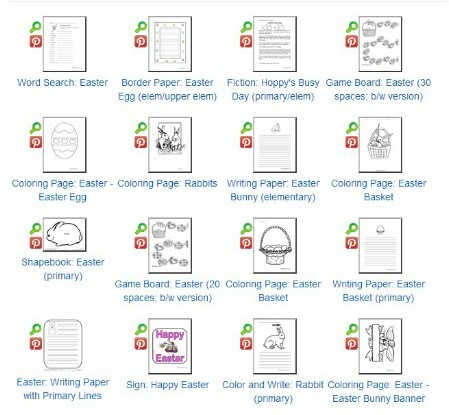 Whether you are a teacher looking for something fun for the kids or a parent who is planning an Easter party, this collection contains great coloring pages and games that are perfect for Easter. You just choose the printables that you want and then print them off. 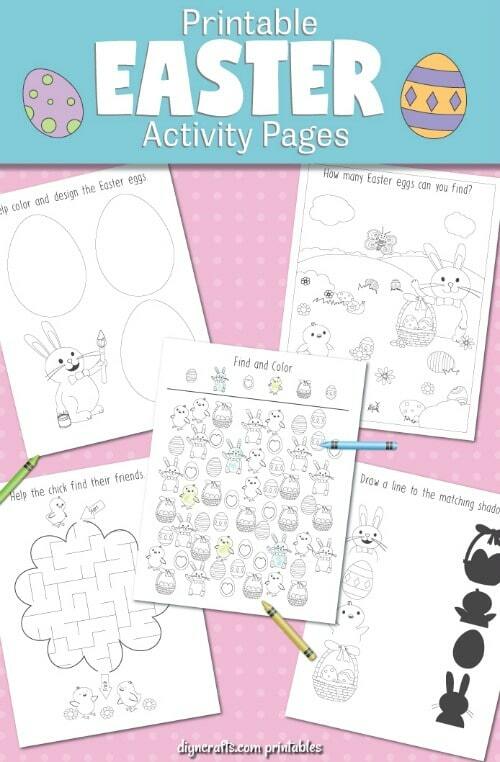 Kids will have a blast coloring all the pages and playing all the Easter themed games. There are pages upon pages of printables from which you can choose. These great printables have loads of things to make your Easter party a huge success. From gift and egg tags to mini flags for cupcakes and even patterned paper, drink wraps, a party sign and a banner. There are also cupcake wraps and so much more. The printables are bright pink but you could probably change the color if you wanted and this collection gives you everything you need for a great party or egg hunt. 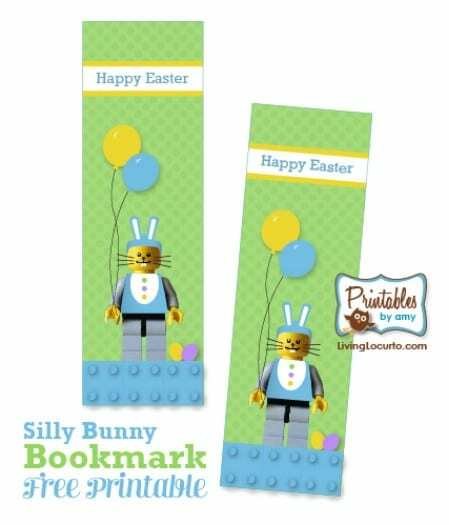 These free bookmark printables combine Easter with Legos to make adorable and very functional bookmarks that kids are going to love. You just have to print them out and then cut out the bookmark. You can print several on one page of cardstock so you can create a bookmark for all of your little ones or these would be great party favors. 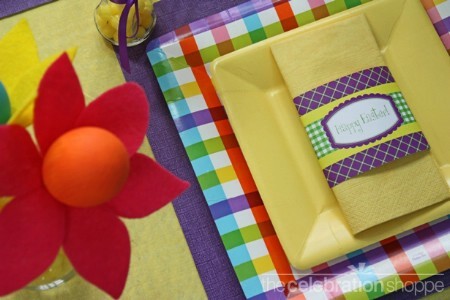 If you are planning a traditional Easter brunch, these printables are a must. The list contains everything that you need for place settings, invitations, signs and so much more. They are in beautiful pastel colors so they are great for any party or brunch. You even get a beautiful triangle banner and a few other goodies to make your brunch a great success. This subway art printable is colorful and fun and contains messages like “Rejoice”, “Jelly Beans”, “Hunting Eggs” and much more. It is done in a beautiful pastel yellow with loads of other colors to make it really stand out. This is a great printable for framing to decorate a table or mantel or you could create a stunning centerpiece from it if you want. Who says Easter has to be about chicks and bunnies? This adorable owl goodie bag comes with a matching bookmark so you can print both and use the bookmark as a goody in the goodie bag. The bag is really easy to put together and is in a great pastel pink color. There is a slot in the side to hold the bookmark. 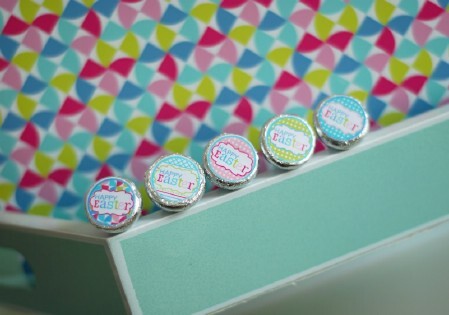 This is great for parties or for something a little special for you little ones. 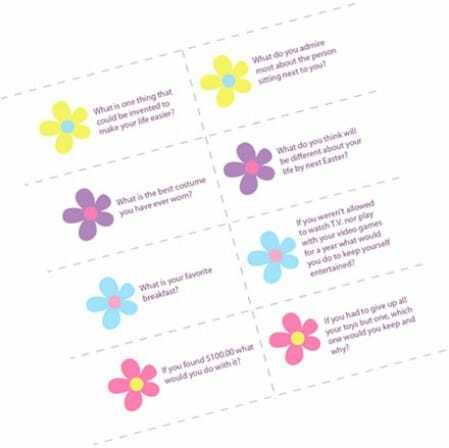 These adorable dinner conversation starters are sure to be the hit of your Easter dinner or brunch. They contain questions like “What’s your favorite breakfast” or “What’s the best costume you have ever worn.” They are sure to spark lively conversation. You just print them out, cut them apart and then place one at each place setting at the dinner table. Guests can go around the table asking their given questions and keeping the conversation alive all the way through dessert. This adorable Kawaii Easter kit printable contains 4 postcards per kit as well as cupcake toppers, hang tags and stickers. You can print off several kits if you need to for parties or just use one kit to dress up your Easter dinner table just a bit. The characters are fun and the kit contains coloring sheets and instruction and materials sheets. Kids will really enjoy these Easter themed puzzles, matching games and lace egg cards. You can print off several to have on hand for your Easter party activities or make them ahead and just use them for your little ones to learn a bit while they are waiting on the Easter bunny to arrive. 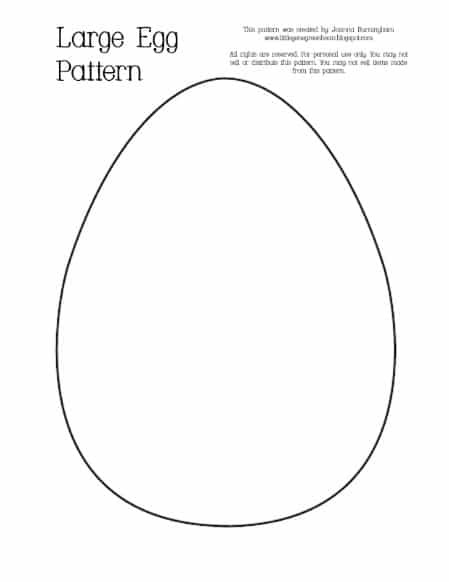 You can print out the egg matching game and have kids color the eggs differently (matching 2 per design) to include them in the crafting festivities. 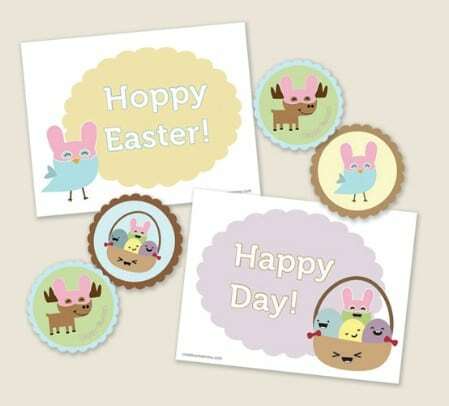 Grab some cardstock and print off these adorable Easter cards that come complete with a cute little chick on each one. These are great to give to teachers, neighbors and coworkers or you could print them off and cut them out to use as place settings or just about anything else you need. The design is really cute and can be very versatile. 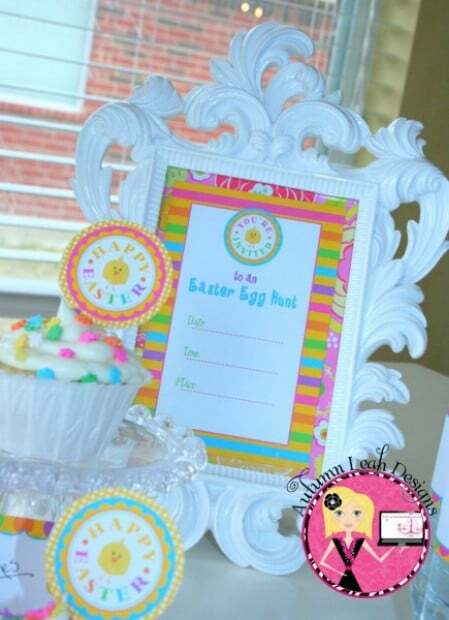 These party printables come in bright colors and include everything you need to plan the perfect Easter party. You get invitations, party circles, food labels, water bottle labels, favor tags, and two different banner choices. The colors are great and this collection really does include absolutely everything you should need for that party or egg hunt. Just print them off, cut them out and organize the perfect party. Dress up those Hershey’s Kisses with these adorable printables. You just print them off on sticker paper and then stick one circle to the bottom of each Hershey’s Kiss. These are great if you are planning to make goody bags for a party or you could just use them to decorate those Kisses and keep them in a bowl on the counter. The stickers can be used for other things as well but they are just too adorable on Hershey’s Kisses. If you are planning a party and you want to decorate everything – even those little water bottles, this is the printable for you. 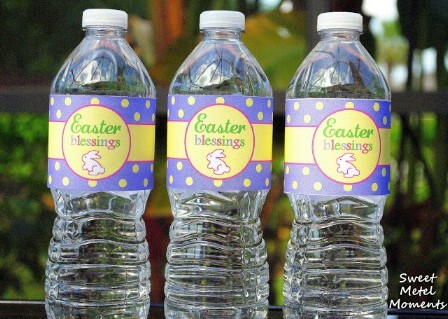 These bottle labels are colorful and have an adorable Easter bunny on them. You just print them out – several to a page – cut and then attach to your water or juice bottles. You can also use them with empty glass bottles to make adorable Easter vases for centerpieces. Imagine the joy in kids’ faces when they see bunny tails on your table. 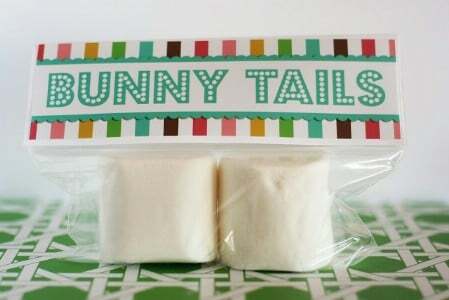 Bunny tails are simply marshmallows and when you print off the Bunny Tails bag topper, you can dress up a plain plastic baggie and make it extra-special. You get a couple of choices of design. Just choose the one you want, print on cardstock, cut out and then staple to small bags of marshmallows for a great treat for partygoers. Let the kids go wild coloring this great box that you can print on cardstock. They can then use the box for anything they want. 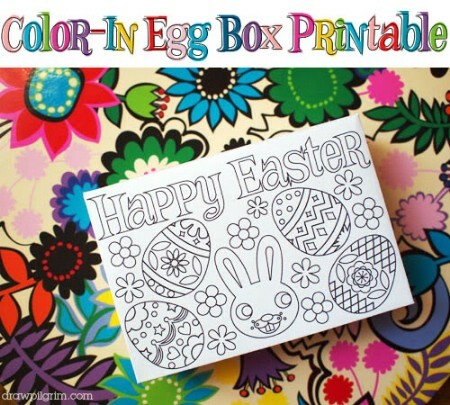 The entire box can be colored so this is a great project to keep kids busy while you attend to other Easter crafts and projects. Once colored, you just fold the box appropriately and the kids can use it to store their favorite party favors or for just about anything they wish. 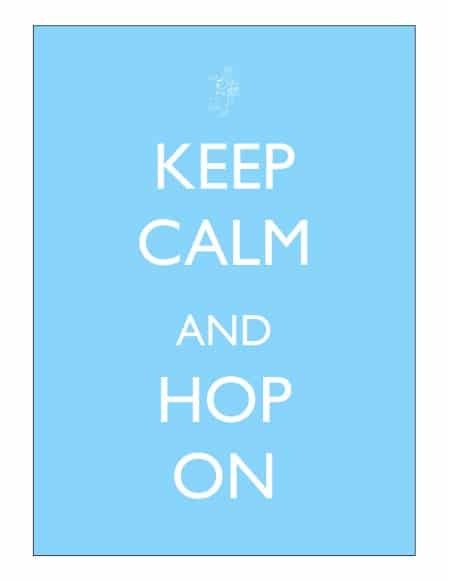 These “Keep Calm and Hop On” printables are adorable to say the least. 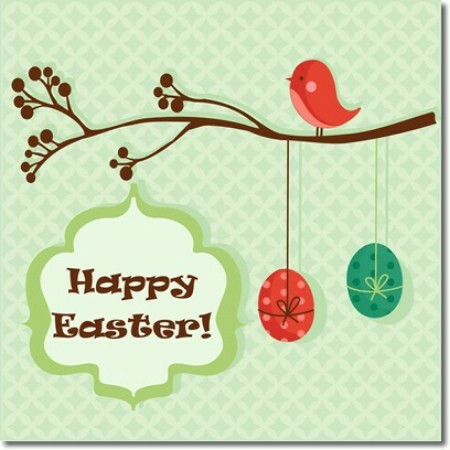 You can use them as Easter cards, party tags, place settings or just about anything you want. They would look great framed and added to your Easter décor as well. They come in six different pastel colors and are the perfect size for framing or creating many other Easter crafts and projects. 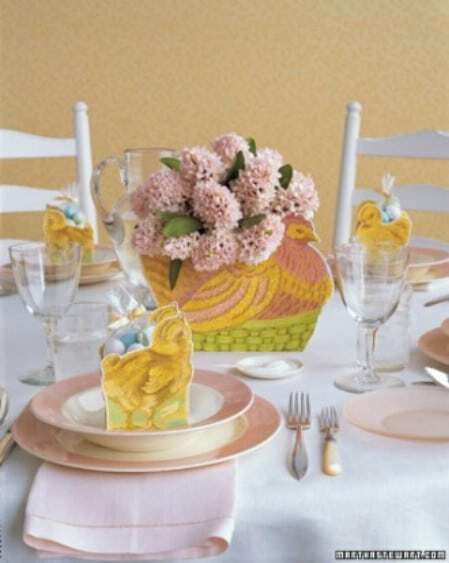 Dress up that Easter dinner or brunch table with these great printables that can be used as beverage wrappers, napkin rings or many other table setting items. 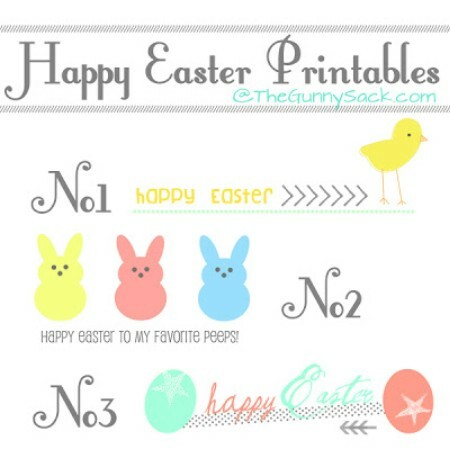 The printable page includes pattern sheets that you can use for a number of great crafts and the “Happy Easter” wrap is great for a craft jar or vase. This gives you a good basis to start organizing and decorating that table and makes it colorful and fun. There are a total of nine different Easter cards that you can print from this collection. Choose one or any combination or take them all. If you have quite a few cards to send out for the holiday, this is the perfect printable collection. No two are the same and they include a downloadable printable for the envelopes as well. You can literally make everything that you need for sending out Easter cards from this one collection. 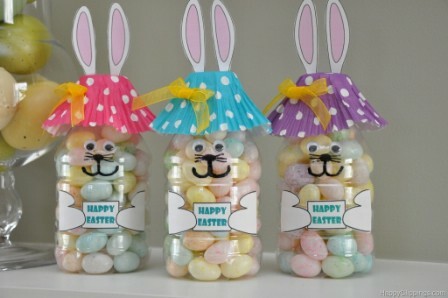 This printable comes with instructions for creating these adorable little Easter bunny bottles. The face, sign and other decorations come in the printable so you just have to supply the bottles and whatever you want to fill them with. 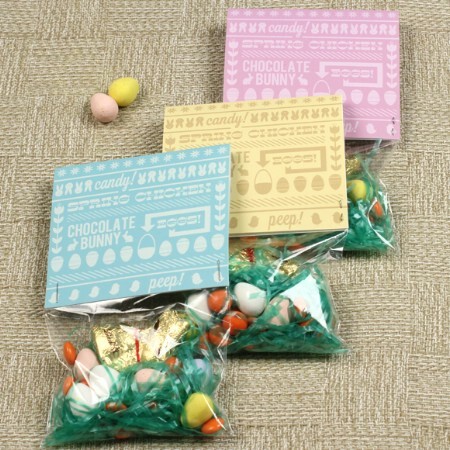 These are great for party favors or you could use them to send with the kids to school for their school Easter parties. A cupcake wrapper creates the hat and the ears are included in the printable. 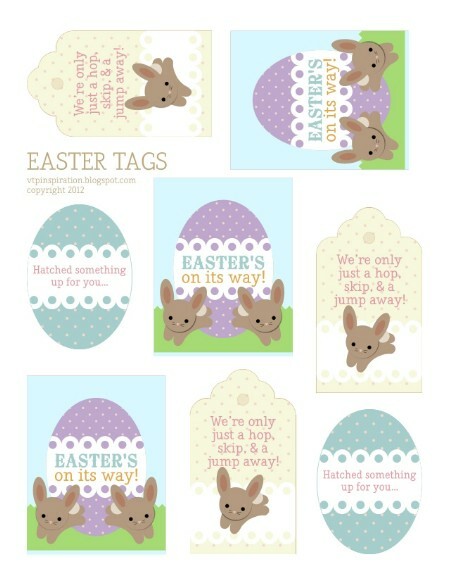 There are Easter tag printables in this collection for virtually every need. Whether you want to make place settings, tag gifts or create little tags for those Easter baskets, these colorful pastel tags are perfect. You could even print them out on heavier cardstock and make Easter cards from them if you want. They have an egg shape with bunnies, chicks and colorful Easter eggs for decoration. 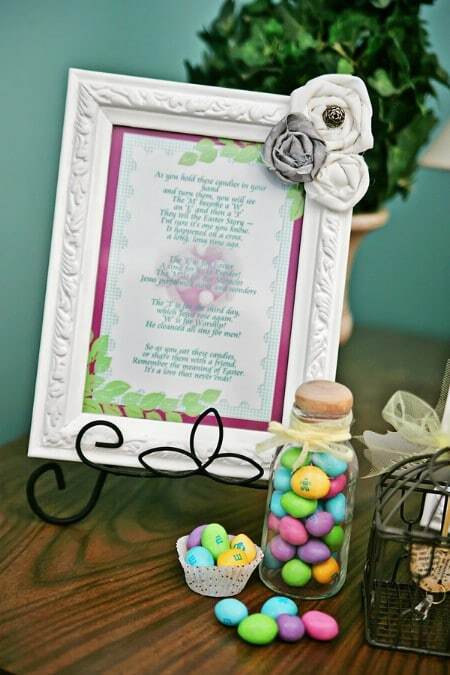 This is a gorgeous Easter poem about M&Ms that would look great framed or you could let kids create it to give with Easter colored M&Ms to grandparents, teachers or just anyone you want something extra special for. The entire design can be printed or you can use the poem and put it in your own design if you prefer. This is a great poem to have sitting next to a bowl of pastel colored M&M candies on an entry table. This printable contains a recipe for bunny chow which is a great party treat. You just make the bunny chow, separate it into small Ziploc bags and then add the label which is the printable. You can print this off on cardstock and have several printables on each page. Then just cut each one out and staple to your Ziploc bag. Bunny chow is yummy and contains things like marshmallows, Rice Krispies cereal, chocolate and loads of other delicious treats. This great hen can be printed out and turned into a beautiful centerpiece for your Easter dinner or brunch table. The printable project also comes with little chicks for place settings or favors so each person at your table can have a little something special. You just choose which printable you want, or get them both and then click on the instructions to put everything together.